In a perfect golf set up, should your feet point out or be square to the target? Well, let's figure that out now! This is a very common question, so let's look at it from a biomechanical perspective so that you can use your body in the golf swing the most safe and efficient way possible. Let's start out with the trail foot (right foot for right handed golfers). What is the objective of the trail foot/leg and hip in the backswing? The main goals are to get load, rotation AND stability which quite honestly, can be very hard for amaetur golfers to achieve all at one time. If your trail foot is turned outward, you are going to allow the hips to have more mobility, which makes it more difficult to feel any stored energy between your lower body and your core. We want the trail side leg to get the muscles stretched, so that we can use it for power and stability. If the muscles are not activated, then you are going to be relying on the upper body to do most of the work. If you have noticed your hips rotating beyond 45 degrees in your golf backswing, then try turning your foot inwards and seeing how limited the range of motion will become. This is a good way to start to feel the muscle groups fire that you need for power. Check out a great video that talks about lower body stability as a whole called "perfecting lower body stability". Also, you may want to check out "load the right glute, shorten swing, start transition" video for a great drill showing you how to load up your trail side properly. Case and point, keep the trail foot perpendicular to the target line so that you can get load, stability and the proper amount of rotation in the hips. Over to the other side, the lead side (left foot for right handed golfers). What is the main objective? The main goal, much like the trail side, is to provide stability, power and the proper amount of rotation. However, this side will be working a bit harder in the swing due to the amount of load it will be bearing at impact. If your lead foot is splayed out at address, that can decrease the mobility in the backswing, which in some cases is not all bad. But, be careful, because turning the lead foot outwards at address can allow much more mobility in the lead hip and that can cause your body to over rotate in the hitting area and make it very hard to maintain stability. For those of you that have limited mobility of the lead hip due to injury, wear and tear, or possibly even surgery, it is ok to allow the lead foot to turn outward a bit. This will take the stress of the hip and allow you to still get into a fully finished golf swing. This also ensures that you are not going to start overusing the upper body through the hitting area. Now, get to work on getting your setup perfect and take a look at some of these other great videos that will help you along the way..
Hey guys, Chuck Quinton here, founder of rotaryswing.com. One of the questions I get asked frequently in emails and questions on the form is, should my feet be splayed out at address. It's a great question, and it has, as you would imagine in Rotary Swing tour, biomechanical foundations for why it should be a certain way. Let's first start with the right foot, during the backswing is where we're going to be focusing on, because what we're trying to do in the backswing is load up and torque the body, and give a firm foundation for this right hip to get some load into this right leg. We can then use the left to drive off. As you get more experience, you can use the right side for power a little bit. Be careful with that one. That's one we don't talk about a whole lot, because people tend to really over do it. But it is available there as you get more and more experience and skilled at using the left side. If your right foot is splayed out at address, what you end up doing is you tend to over-rotate the pelvis. You don't really get any stored energy between your pelvis and your core, your trunk here, because your hips over-rotate. Now I have very little separation here. I also don't have any load in my hip, because I haven't twisted on it. I need to stretch those muscles. To exaggerate this feeling, I want you to practice putting your right foot splayed really in, and try and rotate back. You're going to feel right away that you're not going to have very much mobility here. It's going to keep your hips from over-rotating. We need some hip rotation, about 45 degrees or so. If you're one of those people that tends to let their knee buckle out at address, we see this all the time where the knee externally rotates a lot, and the golfer rolls to the outside of the right foot. All of a sudden they look like this at the top of their swing. There's no power or stability here to come back down. The goal is that that right foot should be relatively square to the target line, about 90 degrees or perpendicular. That's the answer for the right foot. The left foot, a little bit more, shall we say, variable, because what this is going to do is two things. One, if your foot is splayed out a little bit at address ... I'm going to exaggerate it for a second, so it's easier to see. I'm going to put it out about 60 degrees here. As I start to rotate back, and my right foot is square, it's very hard for my hips to turn much more than this. Kind of a good thing. Again, your hips need to turn, but what I see most amateur golfers do is overturn the hips going back. As this foot is splayed out, it keeps your knee from doing this number and buckling in, which keeps this knee from doing this, and this hip from sliding out, and so on. Having it splayed out actually acts a little bit as a restrictor for your hips going back. It's a good thing. At the same point, what it's also going to do is it can keep you from turning enough. We see that happen every now and then. What we use is, we really focus on, in the downswing, how much internal rotational mobility you have in that left leg. A simple way to figure this out, this is oversimplified, but stand up, put all your weight on your right foot, and take your left leg, and just try and twist it in. See if you can get your foot to turn in about 45 degrees in relationship to the right one. If you do, that means that you can probably set your foot up just a little bit open, and get your hips fully turned toward the target, and be completely comfortable, and experience no pain or discomfort in your left hip. Some people, just from different injuries or restrictions, or what have you, can't really internally rotate their left foot very much. For them, to get into a follow-through, if they don't have a lot of internal rotation, they are not allowed to really release. They stop here, and they end up using their upper body to get through the ball, because their hips can't work correctly. For them, we'll let their left leg externally rotate a little bit more at address. That allows them to get into a balanced, relaxed, and stable follow-through position on the left leg. The right foot, keep it square. Again, if you have very limited mobility on this right leg, it's okay to have it externally rotated a little bit, assuming you've got some issues on your right hip. But if you don't, keep the right foot square. The left foot, we'll use a range of typically between zero and about 30 degrees. Thirty degrees tends to be on the maximum side that we'll allow, because any more than that, it really restricts the hip turn going back. Zero to 30 degrees is fine if you keep it dead square. If you're really flexible in your hips, and you can still get in a full hip turn in the follow-through, that's perfectly fine. Zero is perfect, so it'll give you maximum range, but again, zero to 30 degrees or so is perfectly fine at setup. JOIN OUR 352,876 MEMBERS AND GET INSTANT FREE ACCESS TO DOZENS OF VIDEOS! Get Your Free Membership to Finish Watching "Should You Splay Your Feet At Setup" Right Now! Join our 352,876 members to watch this video and 200+ more! 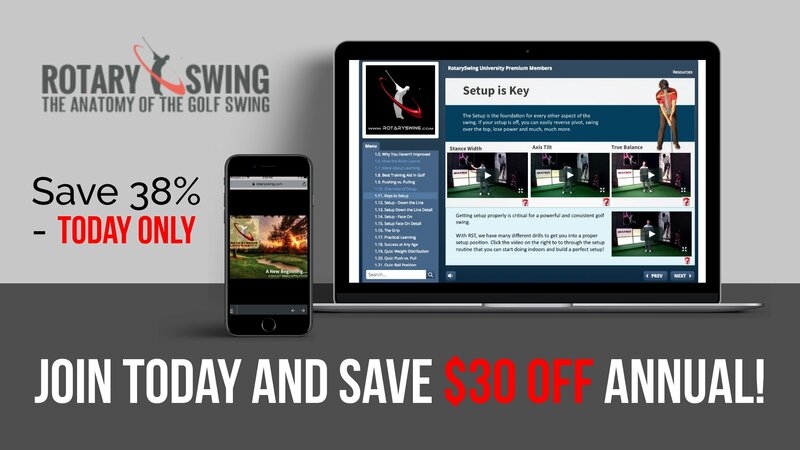 Join RotarySwing today with our lifetime guarantee and your golf swing will never be the same!